James is nothing if not practical. Here he gives more instructions about speech, addressing even the details of how we reinforce our promises. We might be tempted to ask, "Really, James, is it any of your business?" 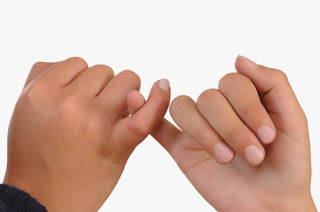 On closer examination, though, several implications of his advice in verse 12 tell us there might be a deeper problem than just loose lips when we promise something and tie up that promise with the words, "I swear by…"
1. Swearing besmirches God's name. "Originally swearing was an attempt to involve the character and authority of God to support a claim or promise (Leviticus 19:12; Deuteronomy 23:23). Then as often is the case today, the Lord's name was debased by using it to excessively emphasize a trivial point. James cites Jesus (Matthew 5:37)…" Jon Mark Ruthven (commentary on James), New Spirit-Filled Life Bible, p. 1757. 2. Swearing implies we've considered lying. Doesn't the need we feel to strengthen our word with an oath telegraph the idea that without invoking a person or thing in this way, we might lie? When we connect God's name to a promise we make, we are in a way scaring ourselves into speaking the truth for fear of the consequences He would bring down on us if we don't tell the truth. James's instructions to speak simply, carefully, and with integrity are consistent with the Bible's admonitions about speech in other places. "He who has knowledge spares his words," says Proverbs 17:27. "Let your speech always be with grace seasoned with salt," Paul tells the Colossians (Colossians 4:6). And by salty speech, I'm sure he doesn't mean speech that's seasoned with profanity (how Jesus used "salt" - Matthew 5:13-16). "Hold fast the pattern of sound words which you have heard from me in faith and love, which are in Christ Jesus," Paul tells Timothy (2 Timothy 1:13). "Likewise exhort the young men to be sober-minded in all things, showing yourself to be a pattern of good works in … sound speech that cannot be condemned" - Paul to Titus (Titus 2:6-8). The challenge still today is to say what we mean and mean what we say in speech that is so honest no "I swear by…" or "for … sake" is ever necessary. PRAYER: Dear God, please forgive me for times I've spoken carelessly, using by-words and minced oaths that add nothing good to my speech. Amen.